Willen in the North East corner of Milton Keynes has two Lakes. These are both artificial and were scraped from the soil some time in the 1970s. Their function is to act as "balancing lakes" that is buffers to soak up sudden surges in storm water. These lakes are linked by a channel so as to act as one. 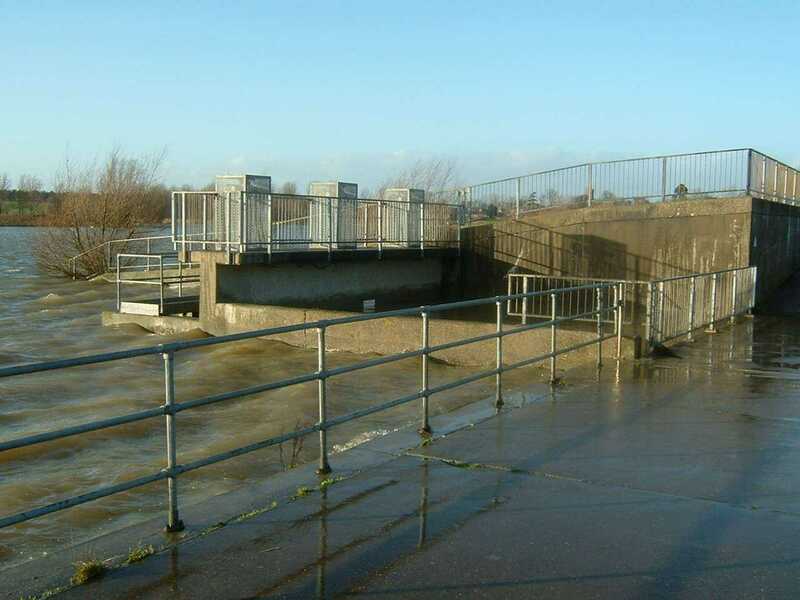 On the East side of the North lake is the sluice control for the buffering of flood water from the river Ouzal which runs along the East side of the lakes. The engineering is quite interesting here. 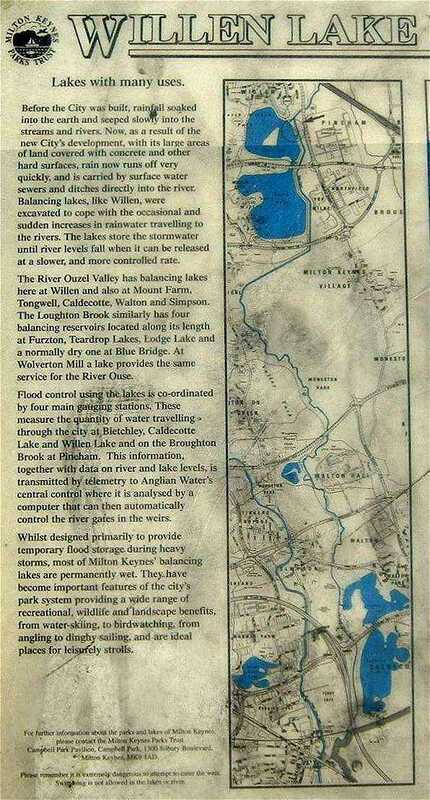 Basically, the Ouzal floods, and to save the towns downstream from flooding, the river is diverted into Willen lake (along with others as mentioned in the first pic below) the lake fills until capacity is reached at which point, water floods over the emergency spill-way back into the river channel and the towns downstream must take their chances - sorry! Over the day and night of Tuesday 9th January 2007, Storms delivered 25% of January's rainfall for the South-East in a single day. The water spent some time running off the hills and fields into the rivers and brooks and a day later, in my area, the river Ouzal was flooded - many of the balancing lakes further south were at capacity and the river burst it's banks and flooded sections of Milton Keynes along with large areas of the rest of South-Eastern England. 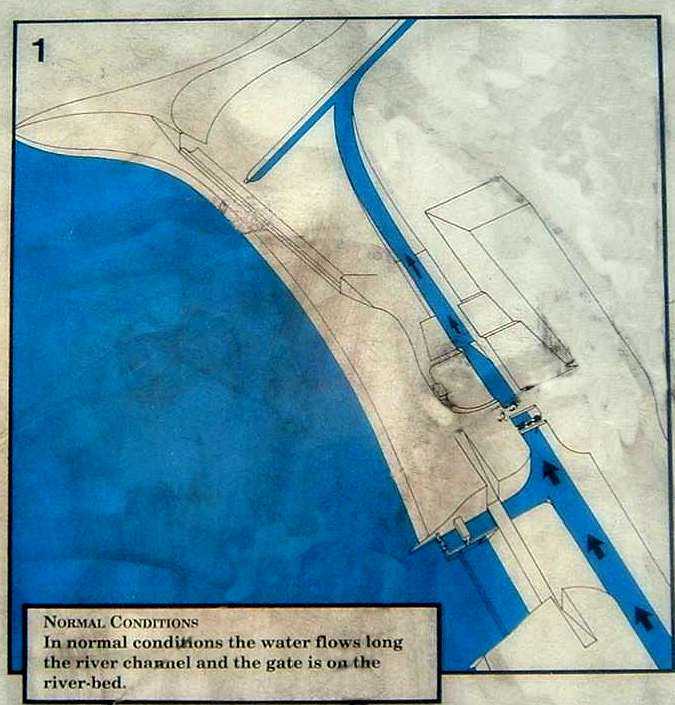 The five images below are taken from an information panel on a stone pedestal and explain the four main stages of operation in more detail. I had to clean them up as the local "yoof" had been around doing what kids do. I was going to try to get it to the point that you couldn't tell where I had cleaned them but what the heck, you don't need that and this way I am not hiding anything. 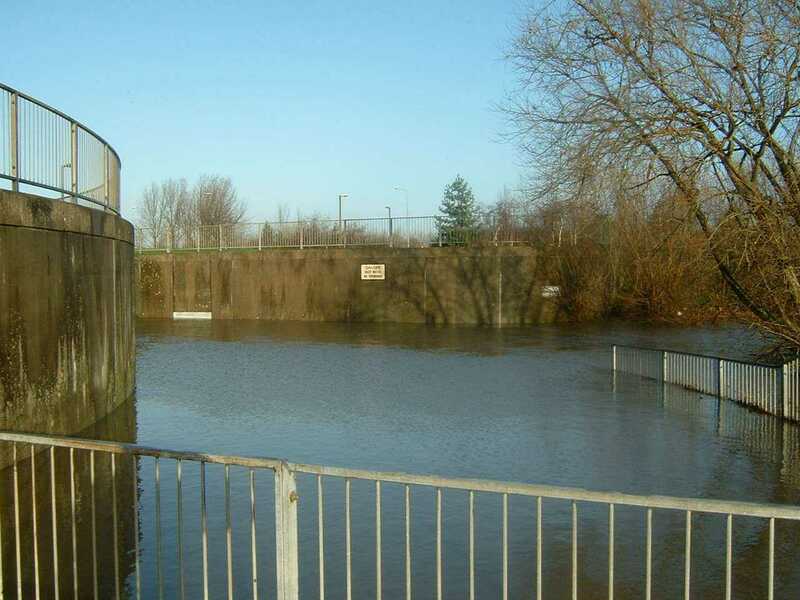 What is not mentioned above is that "normal" surges in the river can be diverted into the lake by use of a sluice at the north end of the side weir - it is not necessary to flood the weir each time flood water is stored in the lake - just when it is abnormally high. This is a view from the North end of the side weir. The swolen river is Left and a fairly full lake to the right. 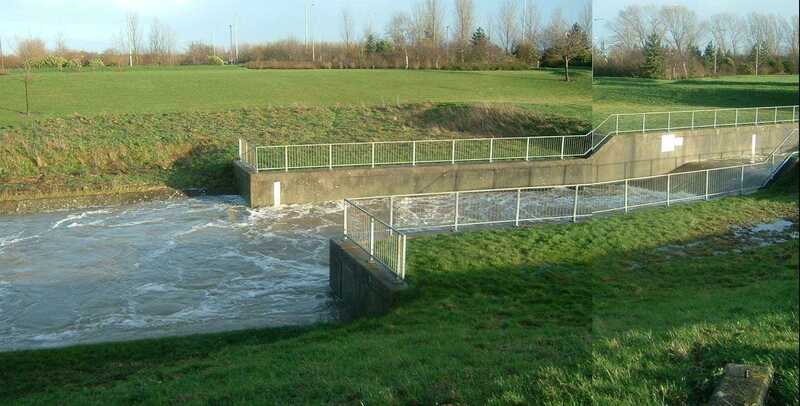 The side weir looking north to the sluice. I think water had recently been diverted over here (stage 2 then 4) as the base had standing water, there was an evident "tideline" of straw and the water level of the lake was only 2 or 3 inches below foot level. Pity I had missed it but floods are like that, things can change by the minute. 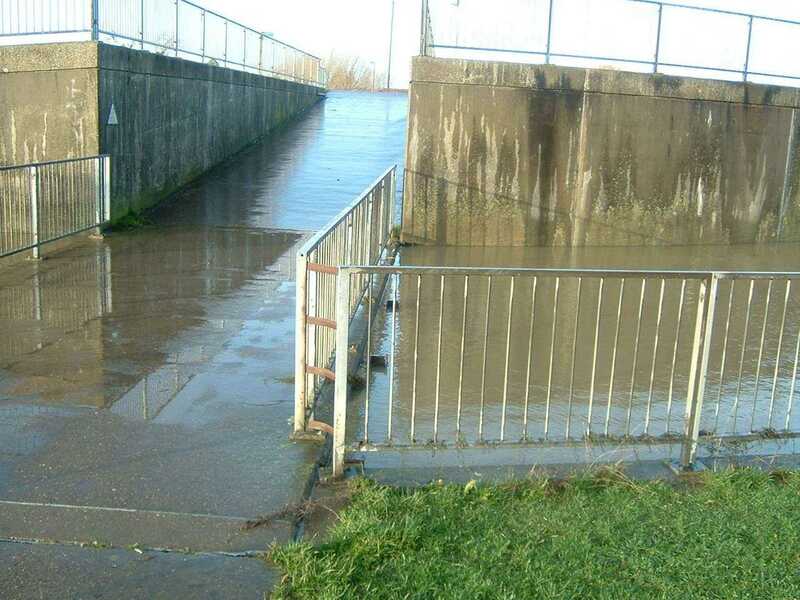 The "Tideline" at the south ramp of the side weir. 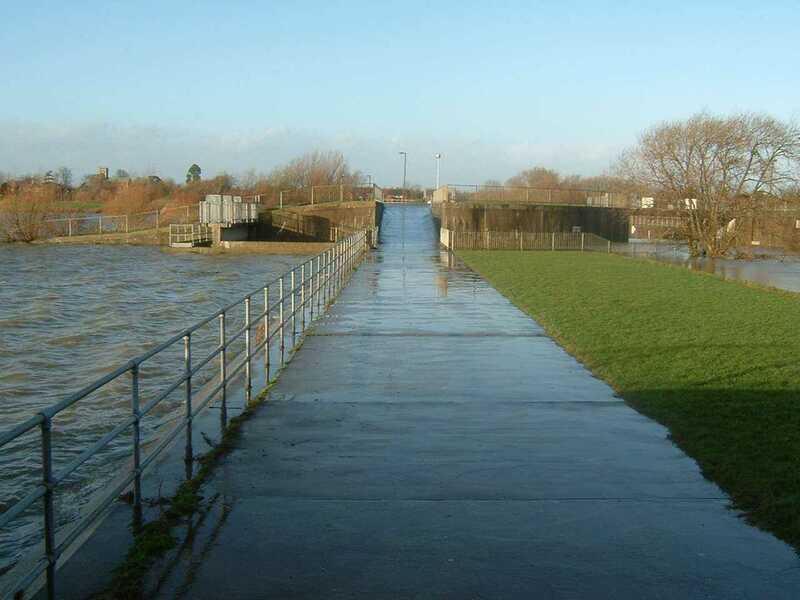 Note the water level at the inlet sluice (lake to the left). River side of the sluice at the base of the north ramp. ... and looking out to the river from the sluice channel. The water here is about 10feet deep. 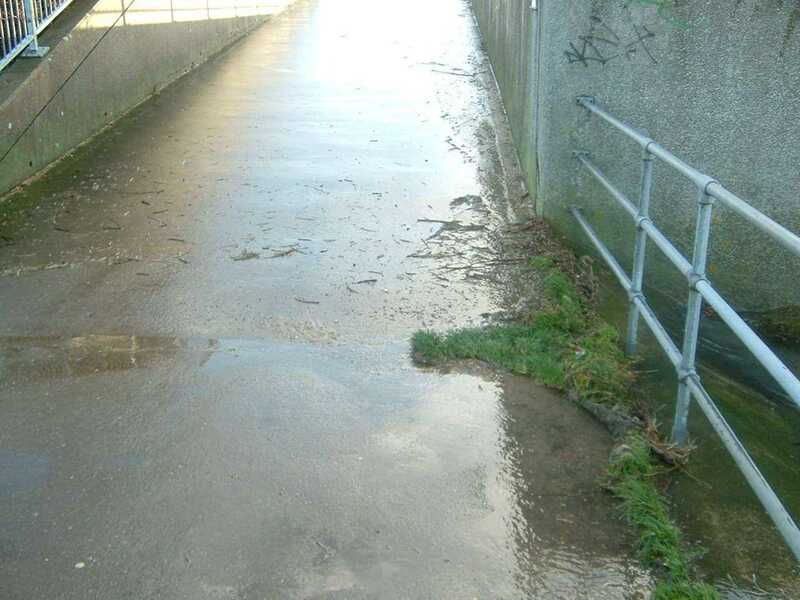 This is the emergency spill-way north of the weir. 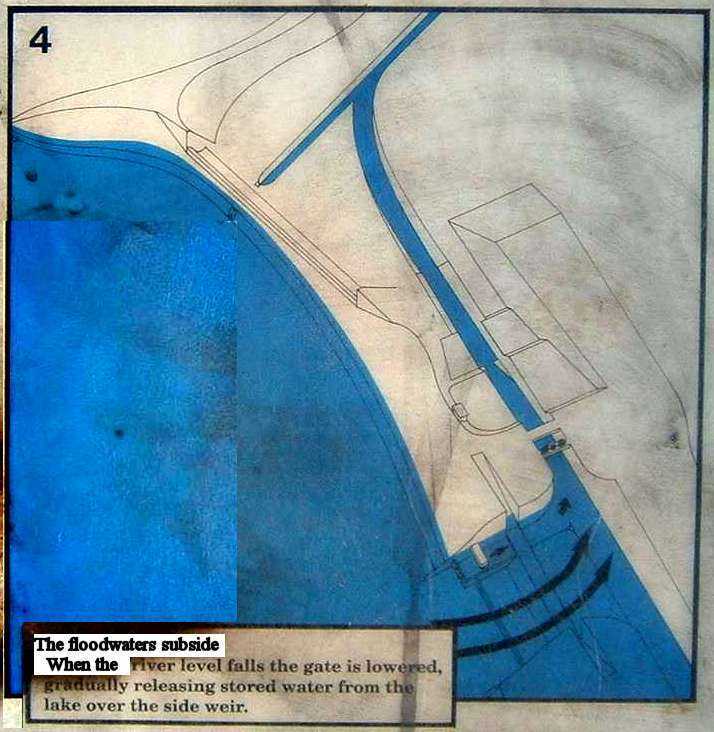 In catastrophic flood conditions, the diversion of the river into the lake is maintained and the lake allowed to flood until in can hold no more - then water will simply flood back over (from the lake on the left) this spill-way into the river course - at this point, all control is lost and preventing the flooding of Willen itself is the sole tennet behind the lake spilling back. 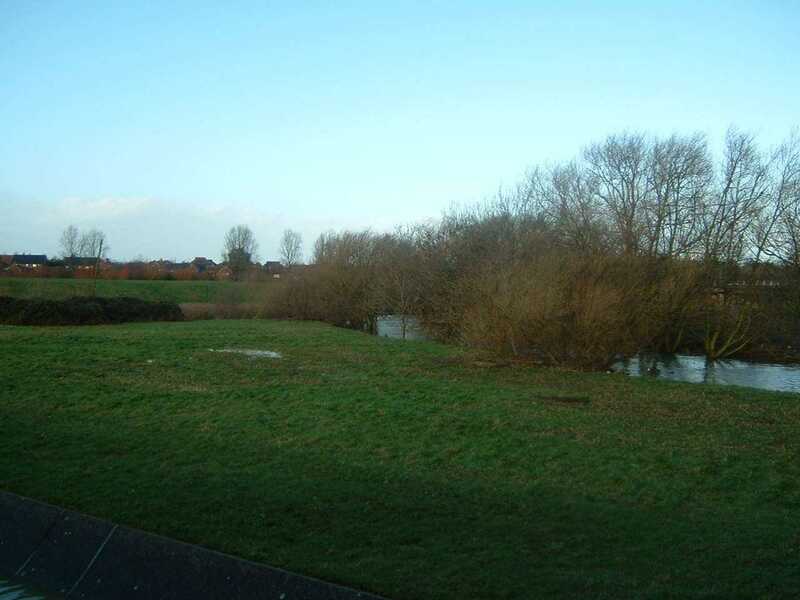 Beyond here is farmland for several miles - not too much of a problem if that floods, but Newport Pagnell is next! It must be noted that the top of the spill-way is about 3 feet above the level of the lake in these pics, so a considerable amount of water storage can take place before stage 3 is reached. 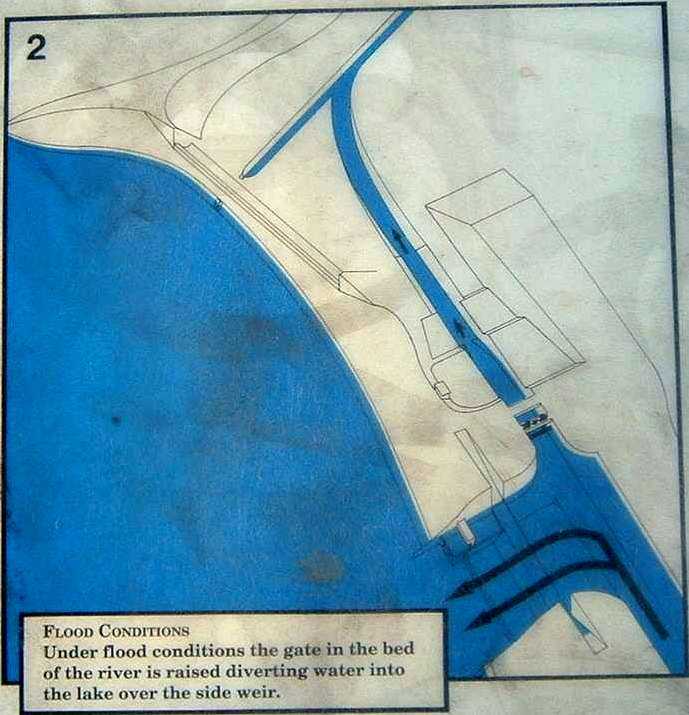 When the level of water spilling over is reduced, the gate in the river bed is gradually lowered so that the river resumes it's normal course. 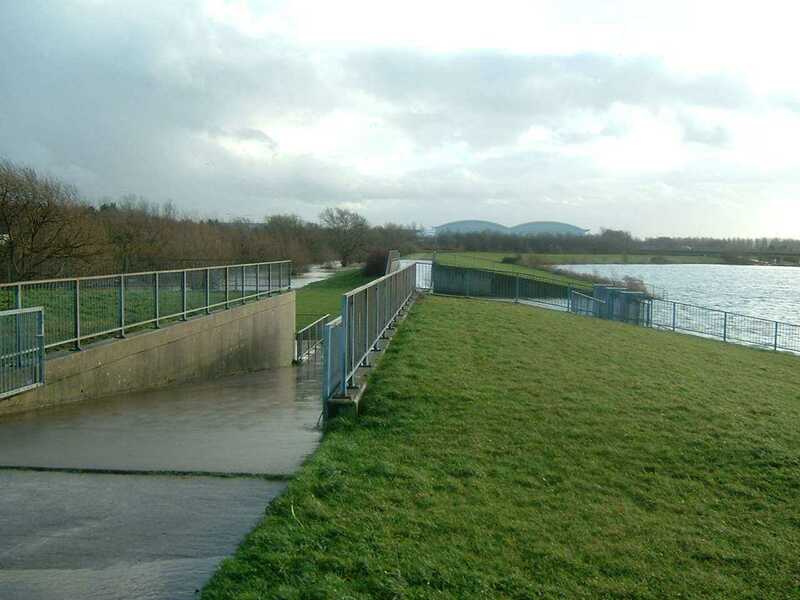 The excess water in the lake is held until levels have dropped nicely and water flows back over the side-weir and later by the sluice, returning the lake to it's normal level. Lastly is a couple of pics showing the river in normal flood. 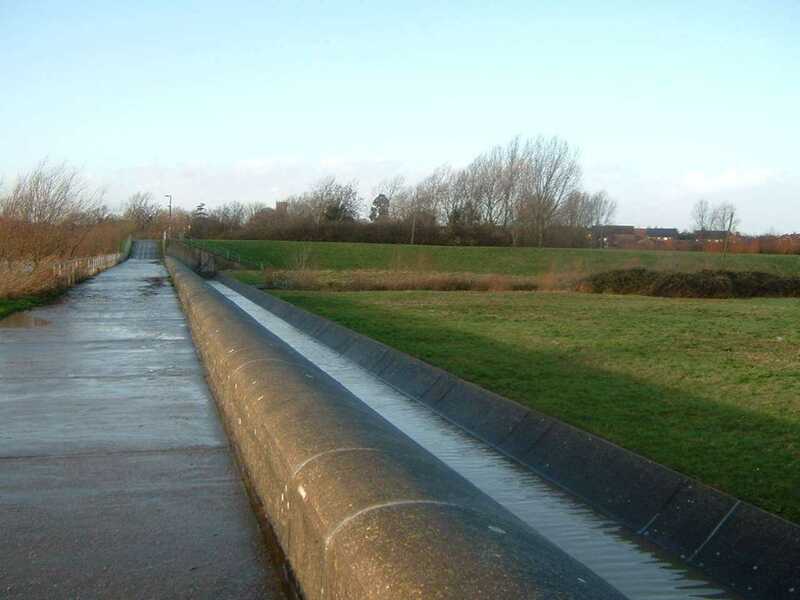 The churn is caused by large concrete baffles in the flow to reduce the speed of the river in the drop and so the amount of scouring that takes place on the river bed beyond. 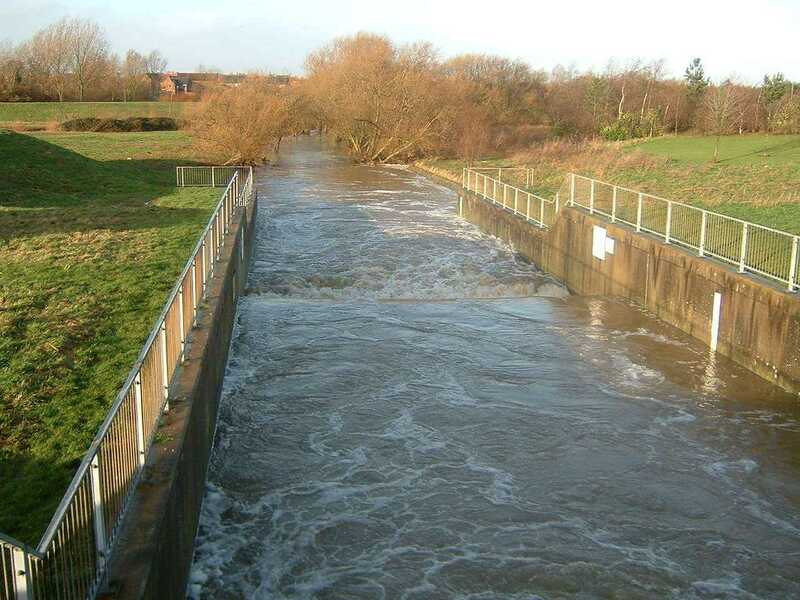 A montage of the river channel between the side-weir and spill-way showing drop and need for baffles. 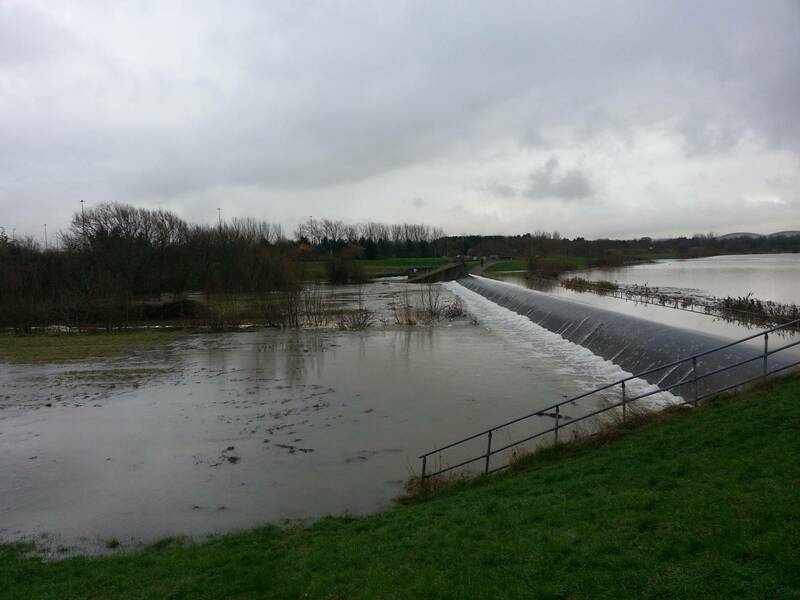 Late November 2012 saw heavy rain over much of the UK causing widespread flooding. Here is a photo of the emergency spill-way in action. 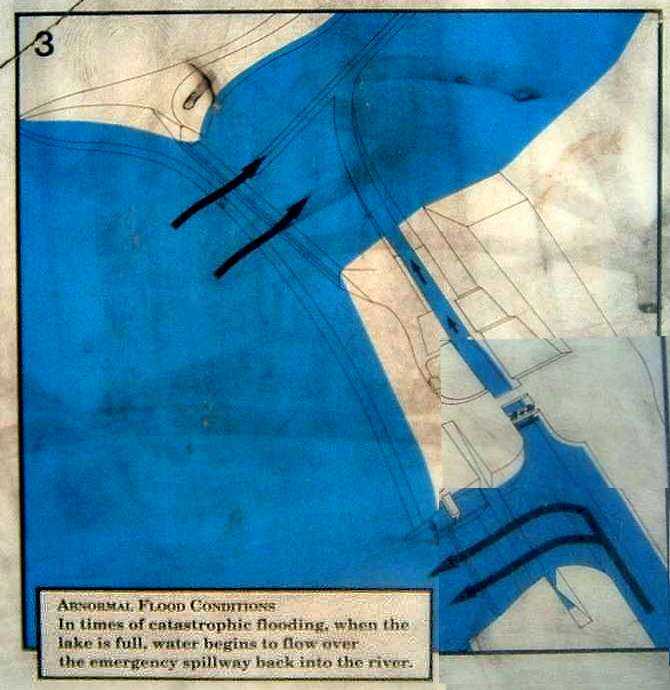 At this point the river Ouzal is in the "Catastrophic Flood" stage 3 in the diagrams at the top. The river has been totally diverted and the lake itself is now at full capacity and there is nothing left to do but flood back into the river and let things take their course.